I’m a diabetic. We should have a group similar to AA. Maybe a 12-step program would help us avoid foods that have an adverse affect on blood sugar. Egg drop soup is one meal that is both satisfying and tasty. At the same time, it will help keep your blood glucose monitor reading well within the safe range. Eggs are good, high in protein and low in fat. The trick is to come up with a recipe that will transform a couple eggs into a meal that will take care of the larger appetite without adding other food items that will overshadow the low glycemic affect of the eggs. I found an egg drop soup seasoning packet for $2 in the Asian food aisle at the supermarket. It would have created a fine bowl of soup, the price seemed a bit high for a small package of seasoning. So, I set out to find out what was involved in the recipe so I could make it myself. Turns out, the 2 main ingredients in the packet were a thickener and salt; pretty easy to duplicate. After a couple trials, I adjusted my final recipe so that the measurements made use of standard available goods. I also thought the addition of some lean meat would add that heartiness that will carry you through the evening and prevent you from hitting the cookie jar at the worst possible time of day. Place the diced chicken in a soup pot with 1 tablespoon of oil. Heat on medium and stir occasionally until the meat is thoroughly cooked. Add one can of chicken broth and de-glaze the pan to get all the flavor bits into the soup. Pour half of the second can of chicken broth into the pot. Save the remainder to mix with the cornstarch. Add the ginger, soy sauce, and onion. Bring to a light boil, then cut back the heat and allow it to simmer for about 10 minutes to blend the flavors. While stirring, pour the beaten eggs into the soup very slowly. This will allow the egg to cook as stringy pieces. Mix the cornstarch with the remaining half can of chicken broth, then pour it into the soup while stirring. The soup should thicken nicely. If you want a thicker soup, just mix a little more cornstarch with cold water and add it to the soup. 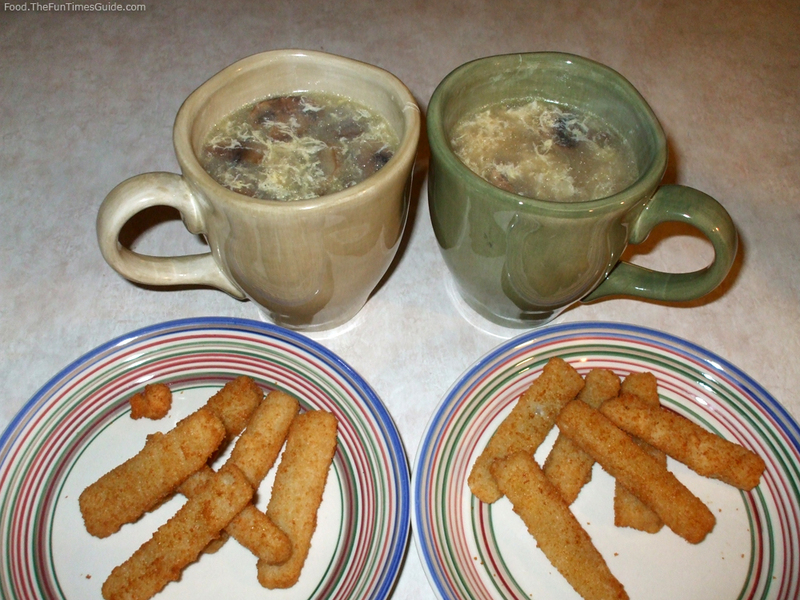 To try something different, the next time I make this homemade egg drop soup I plan on substituting about a cup of cooked shrimp in place of the chicken thigh. One bit of advice… if you try this variation, be sure to put the shrimp into the soup just before you add the egg. Shrimp is tender and only needs to be warmed up since it’s already been pre-cooked. 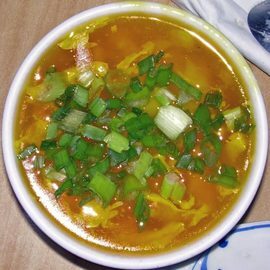 While researching this egg drop soup, I found another variation that included adding a 14 oz can of diced tomatoes as well. This would increase the quantity of soup to enough for 3 good-sized bowls. Or, you could add sliced mushrooms. The recipe as listed will easily feed 2, even if one person wants a little extra. I know I did, and of course there were no leftovers.